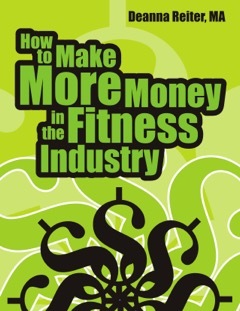 Do you want to make more money in the fitness industry but don’t know how to go about it? Maybe you’ve been told that you’re a valuable asset to your employer, but your paycheck doesn’t reflect that. Maybe it seems overwhelming to change your current situation or impossible to start a business. When Deanna Reiter started her career in fitness in 1996, she had those same thoughts. And after years of learning the hard way, she figured it out. How to Make More Money in the Fitness Industry is the result of her journey written in an easy-to-understand guide that you can apply today.